Primary polycythaemia, also called primary polycythaemia vera or PV, is a condition that causes a high red blood cell count. Red blood cells contain a substance called haemoglobin, which carries the oxygen around your body. Most people with polycythaemia remain well, but they do have a higher risk of getting blood clots. These can lead to deep vein thrombosis (DVT), pulmonary embolism, strokes, heart attacks, or loss of the blood supply to a toe or finger. You are much less likely to get a blood clot if you have treatment to lower your haemoglobin and red blood cells to the normal level. There are two types of treatment: regularly removing blood (called blood letting or venesection), and drug treatment, usually with hydroxyurea (see below). We also advise patients to take low-dose aspirin, as this also reduces the risk of blood clots. However, some people can't take aspirin because it irritates their stomach. 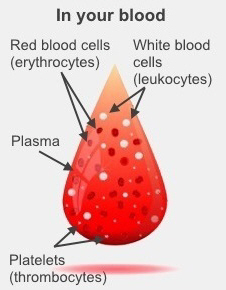 How and when does blood letting happen? If you have blood removed, it will usually be done by a specialist nurse at the hospital haematology clinic. However, your GP or a hospital blood specialist can also do it. You will have just under half a litre of blood taken, much as if you were a blood donor. It's a very straightforward procedure, and only takes about half an hour. Usually you'll have this done every few months. How will I get my hydroxyurea? If you are well and on regular venesection or a stable dose of hydroxyurea, you will mostly see your own GP, which is much more convenient than coming into the hospital. Your GP will arrange to get your blood checked regularly, and will let you know if you need any changes in treatment.